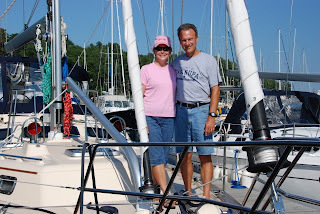 Welcome to the cruising blog of Wayne and Michele Sharp! 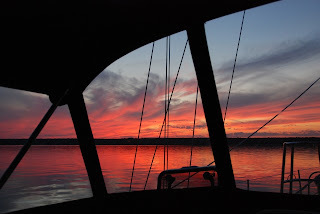 Join us as we chronicle our journeys and adventures aboard our s/v Lena Bea, an Island Packet 445. 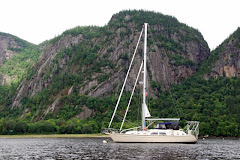 Our maiden voyage in 2007 was from Bayfield, Wisconsin on Lake Superior via the Great Lakes, St. Lawrence Seaway, Eastern Seaboard, and ICW to Punta Gorda, Florida. 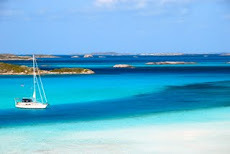 We traveled to the Exuma Cays in the Bahamas in 2009 and 2011, and also to the Ragged Islands in 2011. Our most recent trip in April and May, 2013, was to the Abacos, Bahamas. Welcome to the cruising blog of Wayne and Michele Sharp! If you want to learn a little bit about cruising, satisfy your curiosity, live vicariously, or be entertained, I think you've come to the right place. Feel free to ask questions or post comments in the comment section of each post; I will respond to all of them. You can also email us at reluctantsailor@me.com. We've written a book based on the blog from our first journey in 2007 - Adventures of a Once Reluctant Sailor: A Journey of Guts, Growth, and Grace. It is available online from my website at reluctantsailor.net, and from Apostle Islands Booksellers, Copperfish Books, Amazon, and Barnes and Noble. Your local bookstore can also order it for you. We've included over 170 color and black and white photos. Oh, Canada! You busted us at customs! We’re docked at Roberta Bondar Marina in Sault Sainte Marie, Ontario. I am frantically trying to multi-task online, watching the clock like a prisoner on death row. Reply to emails, upload photos, post to blog, download and install satellite data software, and if time allows, I'll read the news and get caught up on what's happening in the world. We need to leave by noon or so to get to our anchorage in the North Channel at a reasonable hour. 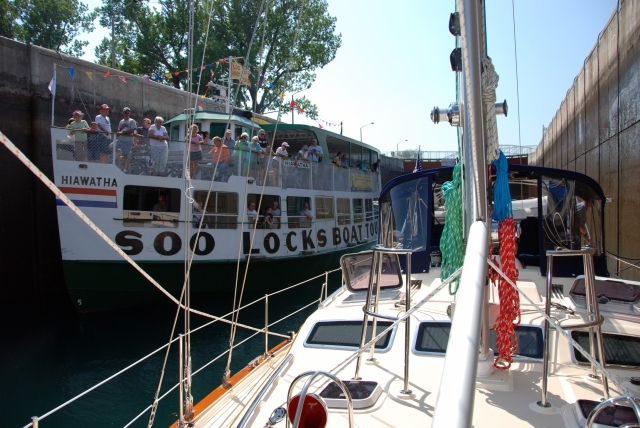 We experienced the first of many locks yesterday, my first time ever. It was a bit nerve-wracking, especially not knowing what to expect, but all went smoothly. After docking at the marina, our first duty was to check in with Canadian customs using a special phone on the dock. Wayne was up there for quite a while before he returned to the boat for an exact count of the alcoholic beverages we had on board. Now, we didn't have a whole lot - we're not big drinkers - although we did stock up for the entire trip before we left, but apparently it was more than Canada thought we should bring into the country. Wayne returned to the customs phone, where I'm sure he told them - to the ounce - exactly how much we had. He disappeared into the marina building and was gone for a long time. I'm thinking, "Oh dear, they threw him in the slammer. Now who's going to drive this boat?" But no, they just taxed us $17 for our excess. Note to selves: get below the limit before clearing Canadian customs next time. We grabbed a bite to eat at the restaurant next door, came back to the marina, and got online for a little while before turning in for a FULL night's sleep. It is stifling hot here, so we were grateful to be plugged in at the dock and able to run our air conditioner without using the generator. Tonight we will anchor in Milford Haven, on the west side of the North Channel. It was a recommendation from Fred - hi, Fred! - in the slip next door. Fred was once chased by a BEAR! After today, I don't know when I'll be able to post again, unless we can get our satellite data going. Wayne’s working on it. Psalm 147:1 "Praise the LORD. How good it is to sing praises to our God, how pleasant and fitting to praise him!" We are incredibly thankful for the ideal conditions we have had from the start of this trip. God has blessed us with perfect weather and blissfully calm water. True, with almost no wind we've sailed very little, but God knew we needed a few days to find our sea legs and acquaint ourselves with the new boat and equipment. This will sound strange, but it's been a blessing to not have the distraction and commotion of sailing; even Wayne agrees with that (well, somewhat). It's also been a treat to just veg out and relax after months of nonstop preparation activity. We so appreciate the opportunity to sit and do nothing without a long to-do list hanging over our heads. So, aside from relaxing, how do we pass the time? Well, obviously I'm working on the blog. We're reading our cruising guides to determine where we want to go and what we want to do when we get there. The guides also give us water depths, show us desirable anchorages and the locations and amenities of marinas, and warn us what to watch out for. As I mentioned earlier, Wayne is acquainting himself with the new instruments. I've been taking photos, sorting them out, editing, and preparing to upload them. Cell phone coverage has been surprisingly good, so we've been able to make some phone calls. Then there's just the day to day ordinary stuff like meal preparation and cleaning up. We left our anchorage in Grand Marais, Michigan around 4:00 this morning. There was a little rain shower early, and Wayne had a visitor - a bat - join him in the cockpit. It was gone by the time I got up, but Wayne barricaded the companionway to keep the little guy out of the cabin, and opened all the enclosure panels to facilitate his escape. Half an hour ago we passed by Whitefish Point, where many of Lake Superior's shipwrecks are laid to rest. Wayne said there's a shipwreck museum there, which he visited when he did the Trans Superior Race in 2003. We're now headed for Sault Sainte Marie, ETA 3:30-4:00. We WILL have internet service there; we will actually get off of the boat and walk, go out for dinner, go to the grocery store, etc. I’m ready for a boat break! Yesterday we traveled about 105 nautical miles (or about 120 land miles) at an average speed of seven knots, motoring for all but half an hour. It was a long day, having started shortly after 3 a.m., and we didn't anchor until 8 p.m. It will be another long one today; Wayne was up and going at about 3:15, I was up at 4:45. We have to stagger our sleep on these long days so that one of us is always alert. Wayne is sleeping right now and I’m on watch. Otto Pilot is driving, so I just check the instruments periodically to make sure there's nothing ominous on the radar and that we're still on course. The instruments on this boat are awesome, but as with all things high tech, there is a learning curve. Wayne is in his glory playing around with them. Me? Well, I let him figure it all out and then show me what I need to know. The coolest thing happened yesterday. We attempted to get wi-fi in Houghton, and although there were signals galore, we just couldn't connect to anything. Our main objective was to upload photos to Walgreens for Wayne's mom because she doesn't have a computer to follow our blog. After spending about half an hour anchored in Houghton trying to pick up a decent wi-fi signal, we finally gave up in frustration and continued on through Portage Lake. 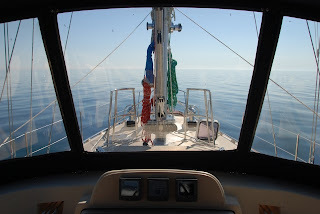 I had our last two blog posts in my email outbox and decided, what the heck, I'll leave my computer running and hooked up to the wi-fi booster antenna and maybe I'll get lucky - sort of like throwing a hook in the water while you're boating to see if you catch any fish. I checked my email after we anchored and lo and behold, I had new email and the posts had been sent! You can be sure we'll be "trolling for wi-fi" frequently. That works for email, and it's great that I can email posts to the blog, but actually getting online to upload photos, add links, or do anything else with it is a lot more difficult. I might be able to do that this evening when we're anchored in Grand Marais, Michigan, but I'm not counting on it. I look forward to having an extended time to fix up the blog to make it look more interesting. I'm new at this blog stuff and there's a lot to learn. I had never even seen a blog until about six months ago. Fortunately, I have the blog set up to email me comments from others that are posted at the site. THANK YOU! to Tracy, Mary D, Denise, and Alan for your comments! It's lonely out here and it’s such a treat to hear from people. We also appreciate knowing that someone is actually reading our blog, so stop in and say hi when you get a chance, or just send an email. Do you have questions for us? I'll do an FAQ page if I get some. We awoke early and left our anchorage a little after 3:00 this morning. Sat in the cockpit in the dark, still half asleep, drinking our coffee in mostly silence. I went back to bed around 4:30. When I got up, I was astounded by the calmness of the water. This is Lake Superior? We've been motoring all day and the lack of wind gave us the chance to finish up some things around the boat. It’s our first night out and it couldn't be a more glorious sendoff evening. I had dinner ready before Wayne dropped the anchor: lemon pepper chicken, corn, and a bottle of chardonnay. The water is still and there's hardly a breeze. Stockton Island is a popular spot to anchor and camp, so I hear faint sounds of laughter, conversation, music, singing, and even the occasional sound of a fish breaking the surface of the water. I see the flicker of campfires and wafts of smoke from the island. I smell the subtle aroma of pine burning, a delicious blend of campfire and Christmas. Everything is tuned to just the right pitch, not so overpowering as to offend my senses. The moon is full and the sunset is so spectacular that I keep putting my computer down to grab my camera. This is what I like most about sailing. Thank you, God, for the bon voyage party. It's a good omen, don't you think? I envision God smiling and nodding his approval...for our timing and for trusting him enough to make this trip. I imagine his joy...at the adventure before us and the joy we will experience as we become intimate with his creation. Random thoughts: I will miss the Apostle Islands. I will miss the town of Bayfield. I will miss the people at Port Superior and Pike's Bay. Who knows if we will ever sail these waters again? I look at the water and think, "We sure will be seeing a lot of this the next three months." I wonder how Brian is doing with his chemo and radiation treatments. I wonder if our Sea Bands will really keep us from getting seasick. And I sure hope there's nothing to that superstition about it being unlucky to leave on a Friday. Wayne's down below calculating whether we need to leave at 3:00 or 4:00 a.m. to get to Houghton before the bridge closes tomorrow evening. With that thought, it's time to shut down the computer and get to bed. Yes, really. Just a quick post here, as we're scrambling to leave. When I tell people at the marina that today is the today, they just smile, nod, and give me a look that says (justifiably), "Yeah, right - we’ll believe it when we see it." Well, we'll show them! The new heat exchanger arrived today and the installation went without a hitch. Meanwhile, I kept busy installing all our Peek a Booo shutters. Now we have privacy - no more showering and changing clothes in the dark - and a way to keep out the sun. I also got everything stashed. On a sailboat everything has to be put away and all cabinets and drawers latched, otherwise objects will go flying about the cabin, especially in heavy winds or rough water. Neither of those appear to be an issue tonight, though, because winds are calm and we'll be motoring most, if not all of the way, to Stockton Island. An hour later and we are at the fuel dock to pump out our holding tank, fill our fresh water tank, and fuel the boat. I took some photos and will try to get them posted before we leave the dock and lose our internet connection. This is perhaps the most typical view I've had of Wayne recently. After spending hours working on the generator thing, Wayne discovered that there was a leak in the heat exchanger. He called Mas Power, who agreed to overnight us a new one. Well, we just got a phone call from Mas Power, informing us that they missed the UPS deadline yesterday, but it will ship today. Now we can’t leave until tomorrow. Rachael and Claus are - really - leaving today, but have changed their route slightly. Instead of going through Houghton, they are doing a straight shot to Sault Sainte Marie, about 48 hours. We considered doing the same, but Claus and Rachael are both seasoned sailors and licensed boat captains (as is Wayne) with an experienced boat. 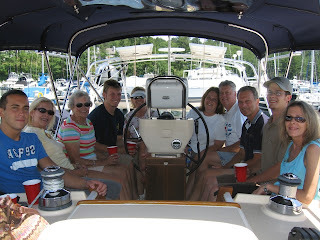 Because our boat is new and our crew - that would be me - a rookie, we decided to be prudent and take it easy at first. Frankly, Wayne and I are both kind of relieved that we have an extra day to wrap things up. Wayne said that, on a number of occasions, if he hadn't experienced problems and delays, he wouldn't have discovered other problems that would have been more serious and harder to deal with after departure. We firmly believe that God's timing will be perfect and that we will know when he is ready for us to leave. Romans 8:28 "And we know that in all things God works for the good of those who love him, who have been called according to his purpose." ...on the boat at the marina (no, we have not yet left the dock), waiting for Wayne to finish working on the generator - an unplanned-for repair that's eaten up hours of precious time - so I can go down and get everything organized, which will probably take all day. Meanwhile, all I can do is look around at the mess and wonder what the heck I'm going to do with all this stuff. Trying to anticipate everything we could possibly need for the next four months and then trying to pare it all down to absolute essentials has been mind-boggling. Remember, we’ve never done a trip anything like this before. Sure, there will be stores along the way, and we'll be picking up provisions as we go, but I want to be well-prepared and don't like having to buy stuff we already have at home. Another challenge has been clothing: we need to pack for all kinds of weather as well as all sorts of activities (hiking, general sight-seeing, dinners out with friends along the way, maybe a show in New York, etc.). In the interest of time, I packed the clothes for both of us. Wayne will have a fit when he sees how many I brought, but hey, did I mention the laundry thing? I don't want to spend any more time than necessary sitting in a laundromat, and you can be sure that's not even a blip on his radar. So why haven't we left yet when we were supposed to have left Friday, Sunday, Tuesday? Boat stuff. Electronic stuff. And I-don't-know-what-all stuff. Maybe Wayne will fill you in later, if he ever reaches a point when there's nothing else to do but write about the trials and tribulations of commissioning a boat. Bet you can hardly wait for that, huh? Mom came into town Sunday morning since we thought Sunday would be the day she'd be driving us back up to Bayfield. We went to the hospital to visit Brian, then had lunch at Amy and Michael's with them and Amy's parents, who were in town visiting from Michigan. We also got together with Joey. I talked to a frantic Wayne that afternoon and told him hey, it's ok, no rush. Originally, Mom had a very small window of time when she could drive us up because she was expecting company this week, but because of Brian's illness (and the possibility that he would be having surgery this week) she cancelled her company and her schedule was freed up. Long story short: We finally got up here about 6:00 last night (Tuesday). The up side to the delay is that I got everything done at home that I needed to and more: made and froze two batches of soup, a batch of white chili, two meatloaves, and lots of brown and wild rice for the trip, and cleaned the house from top to bottom (it's a great stress-reliever). Most of all, though, I had some quality time with Mom before the trip. We had hoped to leave late today, anchor at Stockton Island for the night, and continue on to Houghton in the morning. There's another couple two boats over from us, Rachael and Claus, who, coincidentally (if you believe in coincidences), just happen to be making the same trip we are, only they plan to be gone 14 months and their final destination is the Bahamas. They're weeks farther behind on their departure than we are, and now we're neck and neck. I spoke to Rachael this morning and found out they have the same plans for today as we do, so I made them a friendly wager: whoever gets to Houghton last has the other couple over for drinks the first opportunity we have. The vision of ice cold rum and Diet Cokes dissolved when I got back to the boat and heard Wayne mumbling something about us being lucky if we're able to leave in a week. Just FYI - We got a fantastic deal on a satellite phone with unlimited minutes and you are welcome to call us. I don't want to publish the phone number here on the internet, but we will be emailing it to people. The service should be fairly dependable, but if you don't get through on the first try, wait five or ten minutes and try again...often there isn't a satellite close enough for service. If we call you, the number will not show up on your caller ID; it will say something like "restricted," "out of area," or "unknown." We'll have our cell phones too, of course, but won't always be in the range of cell towers. If you don't have our cell phone numbers, your call will be forwarded to my cell phone if you dial our home number in Plymouth. And of course you can always email us. We'll want to know what's happening with you and with things back home. Communication is vital - I would not be making this trip if we couldn't contact or be contacted in case of an emergency. Today my brother, Brian, learned that he has colon cancer. The doctor said it's curable and hasn't spread, but the tumor has caused a nearly total blockage. He requires surgery, of course, but the doctor wants to do chemo and radiation to shrink the tumor first. Treatment will start on Monday. In light of this, it doesn't feel good to be leaving right now. Please keep Brian in your thoughts and prayers. Looks like we're really going to do this! As we scramble madly with final preparations, reality has hit me: We are really going to make this trip! WOW! You wouldn't believe how much we've accomplished in such a short period of time. Preparations easily could have taken a year or more, especially considering Wayne had to install all the equipment, including the auto pilot, GPS, radar, VHF radio, two air conditioning/heating systems, a generator, additional batteries, an inverter, a feathering prop, etc. He also installed a custom arch with davits for our dinghy and a place for mounting antennas, solar panels, and other equipment. Wayne did at least 95% of the work himself. Our goal was to leave by today, but due to circumstances beyond our control (the delay of vital equipment, etc.) we had to postpone our departure until Tuesday, July 24. Experienced cruisers will tell you that a four day delay is nothing; four weeks, four months, or even four years is more typical. Originally we had planned to leave the beginning of August, but when we decided to take the St. Lawrence Seaway - an addition of approximately 1500 miles - we decided to move our departure up as much as possible. We want to allow plenty of time to enjoy the journey and stop along the way but still be headed south before the weather gets too cold. Because of those pesky hurricanes, the insurance company requires us to stay north of Cape Hatteras, North Carolina until November 1 (hurricane season ends November 30). It will be a mad dash from there since we are expecting company in Punta Gorda the week of Thanksgiving. After ten days at home, Wayne returned to Bayfield last night and is installing the rest of the electronics on Lena Bea while I wrap things up at home. He'll bring the car back on Sunday and Mom will drive us both back up the same day. We're expecting the final pieces to be delivered for installation on Monday, and if all goes smoothly (that would be different! ), we will leave early Tuesday morning. Our first port of call will be Houghton, Michigan - a town familiar to us because that is where Michael, our oldest son, and his wife, Amy, went to college (at Michigan Tech). Michael and Amy joined us the first time we had Lena Bea out on the water, the weekend of June 30; we were delighted with how well she sails. Good thing, huh? The weekend of July 7 we had quite a boatful: Mom, our youngest son, Joey, my sister Bonnie, my sister Ricki and her husband Scott, my sister Andra and her son Justin, and my sister Jodi and her son Brandon. We had the best time! The weather was perfect and we got in two beautiful afternoons of sailing, as well as a visit to Madeleine Island. 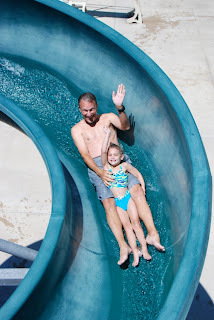 The weekend of July 13 we drove down to Columbia, Missouri for one last granddaughter fix before our trip. The visit with Alex and Suzanne was too short, but we made the most of the time we had. Son-in-law, Brian, is enrolled at the FBI academy in Quantico, Virgina for ten weeks. Spending the weekend with Papa Wayne and Gramichele was a good distraction for Alex, who is very lonesome for her daddy. I wasn't going to do this trip - it was waaayy outside my comfort zone. 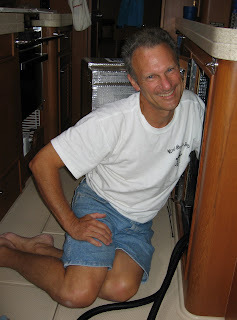 Wayne had often talked about taking a long sailing trip - in fact, his dream was to spend our winters living on the boat. I nixed that idea because I had never known anyone who lived on a boat before - I’m from Minnesota, about the farthest point from the coast of any state in the U.S. - and it was such a radical idea to me. Besides that, our 37' Island Packet lacked modern conveniences that I felt were necessary, it wasn't big enough for me to live in, and just the thought of confinement to such a small space nearly gave me claustrophobia. Also, I didn't care to sail nearly as much as Wayne. I had visions of being left on the dock with a sleeping bag and suitcase when he wanted to sail and I didn't. My dream was a condo with a dock in the backyard - the best of of both worlds. With the purchase of our Florida home (house, not condo) in February, 2004, Wayne suddenly had a purpose and a destination for that long sailing trip. I agreed that we needed to get the boat to Florida, but had my own ideas on how to get it there. My first choice: truck it down. My second choice: take it down the Mississippi. Wayne's first choice: the east coast via the Erie Canal and Hudson River; Wayne's second choice: to the Gulf of Mexico via Chicago, the Mississippi, and the Tennessee-Tombigbee Waterway to Mobile, Alabama. Part of my reasoning was that, initially, retirement was not in the picture and I thought 3-4 months was far too long for Wayne to be away from the business. It seemed to me that expedience was the wiser, albeit less adventurous, way to go. We obviously needed to hash out a compromise somehow. So how did our compromise result in a trip that was approximately 1500 miles longer than the longest route we had considered? And how did I end up making a trip I wanted little or no part of less than a year earlier? In the spring of 2006, someone approached Wayne about buying the business. Things happened quickly, and by the middle of the summer they had an agreement. With my blessing and encouragement, since he would now be retired, Wayne started making plans to sail the boat down the east coast via the Erie Canal and Hudson River. I intended to meet up with him and do a week here or there, but mostly he would be accompanied by other friends and sailors, who were eagerly lining up to do the trip. Fear: the thought of being in water with no land in sight terrified me, as did the thought of being caught in a storm and countless other Vague Unknowns. 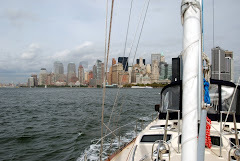 Inexperience: the longest sailing trip I had ever done was a week; 3-4 months seemed like too much of a jump. I had no idea how I'd do on a trip like that and was afraid I would be more of a liability than an asset to Wayne. 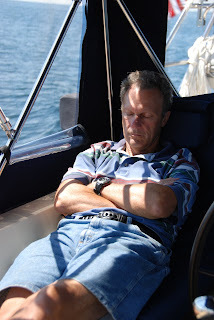 Lack of interest: Unlike Wayne, sailing is not my passion. Homesickness: I just didn't want to be gone that long; I like my land life too much and didn’t want to be away from friends and family for several months at a time. 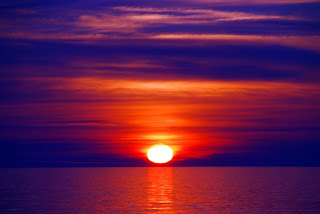 Uncertainties with communication: On previous sailing trips Wayne had done just in Lake Superior, cell phone service or any other type of communication was almost non-existent. I was concerned that we wouldn’t have contact with loved ones. Too much togetherness: I am used to, and appreciate, having lots of alone time, and frankly, the thought of being with someone - even my husband - 24/7 for 3-4 months made me very nervous. We closed on the business November 1 and, after much deliberation and research, bought Lena Bea about a month later from Gary DeSantis, who was a friend of Wayne’s, the owner of Sailor’s World Marina on Lake Minnetonka, and the regional Island Packet dealer. Lena Bea was built the summer of 2005 and brought to Sailor’s World in September, where she sat on a cradle at the marina for over a year and had been on display at the 2006 Minneapolis Boat Show. With the new, larger boat and its modern conveniences (like a microwave oven, large freezer and Vacu-Flush toilets), I began to consider the possibility of doing the entire trip. Only months away, the trip was becoming a reality and I was having second thoughts about missing out on the adventure. I reasoned that, if worse came to worse, Wayne could drop me off somewhere and I could fly home and someone else could fly out to replace me. Although he was leaning towards the Erie Canal/Hudson River route, Wayne still hadn't decided for certain. He continued to research his options. Lena Bea was commissioned up in Bayfield, Wisconsin on Lake Superior on May 31, 2007, nearly two years after she was built and six months after we bought her. It was a major operation; the mast and stays alone weighed about 1500 pounds. Realizing the scope of what would be involved in taking the mast down to get under low bridges and putting it back up again gave Wayne second thoughts about the two routes he had in mind. Stepping down the mast is done routinely for boats that make the trip (there are people who will do it for you), but most masts are 10+ feet shorter and much lighter than ours. So less than two months prior to departure, we finally chose our route and tacked 1500 miles (and a First Mate) on to the voyage. We initially planned to leave August 1; with the change of itinerary we moved it up, but Wayne still had lots of work to do before the boat was ready to go. Where in the world is Lena Bea? We have a SPOT locator system that will show you where we are and gives the previous seven days of travel. You can see it here. 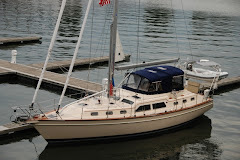 Lena Bea is an Island Packet 445 sailboat. She is a cutter rig, which means that there is a main sail, a forward sail (called a jib, or Genoa), and a sail in between (called a staysail). This combination provides a lot of flexibility in different wind conditions. All sail controls are run to the cockpit for ease of adjustment and safety. 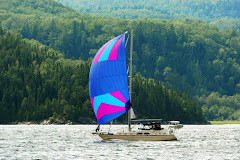 Lena Bea also has an asymmetrical spinnaker, or gennaker, which is a colorful 1,400 square foot sail shown in one of the photos in our blog. This is used in lighter air when going mostly downwind. The boat is also powered by a 75hp Yanmar turbo diesel, and has a Maxiprop feathering propeller. The propeller adjusts pitch for optimum thrust in forward or reverse, and the blades are straight back when sailing for reduced drag. The heart of the system is two Raymarine E80 displays, one at the helm, and one at the navigation station. These are 8” displays networked together by a switch. They are used for a chart plotter (electronic charts and GPS), radar, Sirius weather, AIS (commercial ship identification). The displays are connected to wind, speed, and depth instruments and provide navigation information and calculations. This equipment is used for route planning, to show current position, and to provide an abundance of information to help with navigation. They are also connected to the auto pilot, the VHF Radio, a wireless remote, and a Life Tag System. The auto pilot can steer the boat on a compass heading, by wind angle, or to a waypoint. We use it often to free us up to do other tasks, but one of us is always on watch. The VHF Radio is our primary means of communication with marinas, other boats, and for local weather information. It has current location information which can be immediately broadcast in an emergency. The wireless remote lets us run the auto pilot from anywhere on the boat, and displays other information. The Life Tag System includes wireless devices that we wear. If someone were to fall off, an alarm would sound, the position captured and displayed, and all navigation is automatically changed to the MOB (man overboard) location. Lena Bea has an 8kw MasPower generator, powered by a 12.9hp Yanmar diesel. The generator provides electricity that is used for charging batteries, heating water, running electrical outlets, and running the air conditioners/heaters. Lena Bea has a Prosine 1800 watt inverter. This provides AC power from the 6 house batteries. We generally just power the outlets for computers and small appliances. Almost everything on the boat is powered by 12 volt batteries There are 8 AGM (Absorbed Glass Matt) batteries on Lena Bea. These are completed sealed batteries that can function even if inverted, and they can handle a lot of charge/discharge cycles. One battery is for the engine, one is for the generator, and 6 are for the house. They are 90 amp hours each. Batteries are charged by an electric battery charger, which is powered from shore power or the generator. They are also charged by a high output alternator and regulator when the engine is running. They can also be charged by 2 130 watt solar panels, which are connected via a Blue Sky controller. Lena Bea has 2 Climma reverse cycle air conditioners. They operate like a heat pump, using sea water which is pumped through the systems. A 16,000 BTU system is located in the main salon and also vents to the forward cabin. A 7,000 BTU system is located in the aft cabin (our cabin). 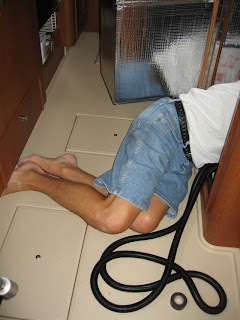 They each have a thermostat, and require 120 volts AC, so we need to be on shore power or run the generator to use them. A Spectra Ventura 150 watermaker was added in 2009. This allows us to run sea water through a filtering and reverse osmosis process to replenish our water tanks. It can produce about six gallons of water per hour. We have a 10.2' Walker Bay Genesis dinghy with a 15 hp Honda outboard. This is our taxi for getting us to shore when anchored or for exploring. Beginning in 2013, all underwater photos are taken with an Olympus TG-1iHS 12 MP Waterproof Digital Camera with 4x Optical Zoom. 1. The greater your need to dock, the less likely the marina is to have space available. 2. If you're planning to anchor, you'll likely be forced to dock because there's no place to anchor. 3. If you are docking, there will be a strong wind, most likely from the least desirable direction. 4. If you put fenders and dock lines on the port side, they will need to be on the starboard side, and vice versa. 5. As soon as you put up your sails, the wind will either die or change to an undesirable direction. This likelihood is directly related to the degree of hassle involved in putting up said sails. 6. If you have a good, steady wind, it's probably on your nose. Copyright © 2007-2014 by Michele Sharp. All rights reserved. No part of this blog may be reproduced. Powered by Blogger.